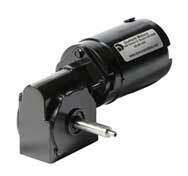 Dumore Motors DR60 custom fractional horsepower permanent magnet DC right angle worm drive gear motors are compact, heavy duty, single reduction worm drive right angle gear motors rated to 60 inch lbs continuous torque. The DR60 custom permanent magnet DC right angle gear motors are powered by Dumore Motors DM32 permanent magnet DC motor in voltages from 12 to 240 VDC with output speeds from 35 to 600 rpm. Dumore Motors right angle gear motors are fully customized specifically for your application, so you get the custom right angle gear motor you need at the price you expect!